Emler Swim School | ProMinent Fluid Controls, Inc.
By switching to automated water chemistry control based on real-time chlorine levels (ppm), Emler Swim School found an effective solution to a recurring problem. When parents of young swimmers look out over the pools serving Emler Swim School, Mike Gentry knows they had better see clear, sparkling water. Maintaining clean, safe pool water at all times is top priority for Gentry, Director of Maintenance – Pool Operations, for Emler Swim School. 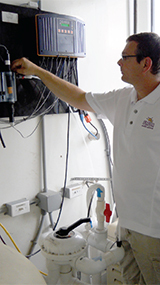 Emler operates seven schools in and around Dallas and Austin, Texas. All levels of instruction are based on Emler’s award-winning SwimScript© curriculum that is continually updated with new techniques to keep it on the cutting edge of aquatic education. 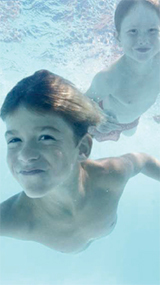 Maintaining clear, safe pool water at all times is a top priority for Emler Swim School. The school is one of the few pool facilities in the Dallas area that has invested in Ultraviolet (UV) Light disinfection systems. Medium pressure UV systems are used for both eradication of micro-organisms and chloramine removal. Difficulties maintaining properly balanced water chemistry can bring numerous problems to indoor pool facilities, so Gentry was concerned when chlorine levels in the pool at Emler’s Frisco facility began to migrate up over the weekends. The DCM-502 is one of the first water chemistry controllers in the commercial pool industry that provides an actual, real-time combined chlorine reading. Based on these real-time combined chlorine ppm measurements, water chemistry at Emler Swim School’s Frisco facility was stabilized almost immediately after final calibrations to the system were made. Due to the success with the new system, the school recently decided to install new DCM- 502 controllers at three additional facilities. The new pool water chemistry controller also controls the facility’s UV system based on the real-time combined chlorine reading and other pool chemistry measurements. By switching water chemistry control systems, Gentry also added mobility to his program. The system provides for standard webbased, real-time monitoring and control via a network-enabled PC, smart phone, iPad or other tablet device. Gentry currently has the school’s water chemistry controllers set to remotely monitor realtime pH levels, chorine levels, combined chlorine levels, TDS levels and water temperature. 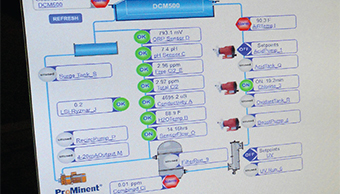 A sample flow from a sidestream is fed to flow cells, where probes read pH, ORP, ppm chlorine and ppm combined chlorine. When the controller reads that free chlorine levels are below the setpoint, additional chlorine is released into the filtered water. Thus, chlorine residual levels are accurately measured and controlled at all times. Programmable alarms notify Gentry and his team if chlorine or pH levels drop below or rise above certain key levels. This provides them with almost immediate notification in the event of an emergency or equipment failure. The ProMinent DCM-502 is also designed to control backwash and filter operations, although Emler Swim School has not yet included those functions in its operations. “We want to become as familiar as possible with the units before we begin to use more of their functions,” Gentry says. Another feature Gentry is looking forward to setting up in the system is its Trackster™ auto poll, data logging, graphing and report building software. “It will be great to have documentation readily available via this proprietary software for capturing data,” he says. 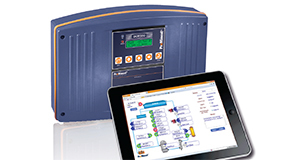 Controller events such as feeder activity, alarms, and individual operator adjustments can also be recorded. In addition, all this reporting data will soon be available via cloud technology. No software will be necessary – all the necessary pool information will be available in the cloud. 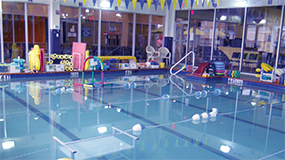 Reliable automation and remote access is providing superior water quality at Emler Swim School during the intervals of heaviest use as well as during times of inactivity, minimizing maintenance concerns – and providing peace of mind.